3-Point lighting is a lighting technique utilizing three lighting instruments; a Keylight, Backlight and Fill Light. The light sources are placed approximately in a placement representing the 3 corners of triange surrounding the subject (when referring to a diagram viewed from above). The Keylight is most often the brightest light source. The backlight only effects the back of the subject and the Fill light adds to dark areas to "fill" in shadowed areas. In modern lighting, the 3-point lighting technique is not used as often as it has been over time because of it's very stylized look that does not lend itself to a natuaral or realistic looking scene. Any light that is a secondary illumination adding to the shadow side created by a primary key light is referred to as a Fill light. 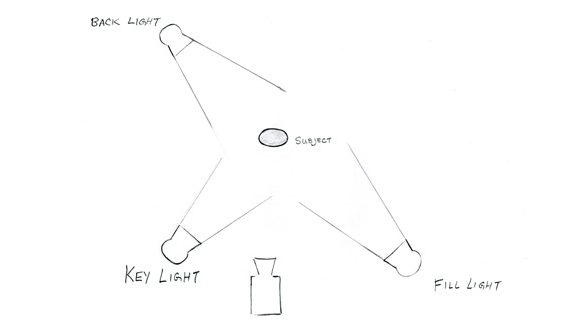 Fill light can be acheived by actively pointing a lamp or lighting instrument at the subject or by passively returning a light source to the subject with a bounce material.